Yorkshire might be famous for its beautiful countryside, its puddings and of course, its cricket team, but this part of England also has some remarkable geology. Through the Vale of Pickering to the North Sea, there are magnificent exposures of Mesozoic-age rocks. Parts of the Yorkshire coast are a haven for fossil hunters and much of the coastal area of “God’s own country”, as many Yorkshire residents call their county, provides the geological standard for comparing less well exposed areas inland and also for the geology of the North Sea basin. Yorkshire Museum has recently opened permanent galleries that tell the amazing story of Yorkshire’s prehistoric past and a star exhibit is a fossil block that contains the remains of several Ichthyosaur embryos. A pregnant pause in deep time. Fossilised Ichthyosaur embryos have been found in Yorkshire. Ichthyosaurs were marine reptiles that superficially resembled dolphins. 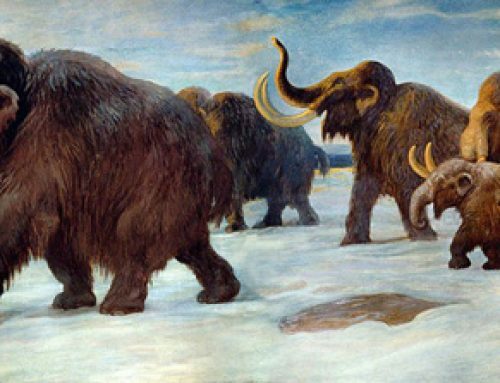 They evolved during the Triassic and numerous different genera have been named. 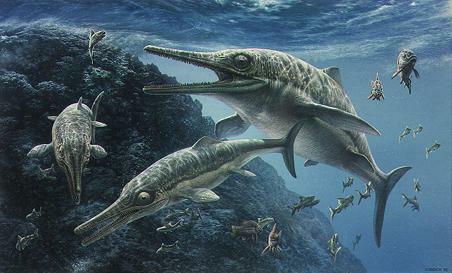 Fossils of Ichthyosaurs have been found in many parts of the world, the first marine reptile to be scientifically described was an Ichthyosaur. The fossilised remains were discovered at Lyme Regis on the Dorset coast and this animal was later identified as a specimen of a giant “fish lizard” known as Temnodontosaurus platyodon. Superbly adapted to a marine existence, Ichthyosaurs had streamlined bodies, steered with their front flippers and propelled themselves through the water with their powerful tails. These reptiles gave birth to live young (viviparous), rather than returning to land to lay eggs. Dolphin-like prehistoric animals, the Ichthyosaurs were a highly successful group of marine reptiles. The Yorkshire Museum Ichthyosaur specimen, complete with the remains of between six and eight tiny embryos between its ribs, was collected from the Whitby area of North Yorkshire back in 2010. We at Everything Dinosaur, suspect that the fossil was found in sediments that make up the Whitby Mudstone Formation. The fossil was in the possession of a local collector, Martin Rigby, he thought the block could contain the remains of unborn Ichthyosaurs and this was confirmed when the specimen was examined by palaeontologists from the University of Manchester. The specimen consists of a polished block which exposes several large ribs of the mother and numerous strings of tiny vertebrae and small bones that constitute the remains of the unborn “fish lizards”. The fossil has been acquired by the Yorkshire Museum and forms an integral part of the Museum’s new permanent exhibition “Yorkshire’s Jurassic World”. Only five Ichthyosaur specimens from the British Isles have ever been discovered with embryos preserved and never before has a British Ichthyosaur fossil been found with so many. All five known specimens were collected from Jurassic-aged rocks in the south-west of England, they are aged between 200 to 190 million years old. However, the Yorkshire specimen, heralds from younger Jurassic sediments dating from the Toarcian faunal stage of the Early Jurassic. It is around 180 million years old. “We also considered the possibility that the tiny remains could be stomach contents, although it seemed highly unlikely that an Ichthyosaur would swallow six to eight aborted embryos or new-born Ichthyosaurs at one time. This does not seem to have been the case, because the embryos display no erosion from stomach acids. Moreover, the embryos are not associated with any stomach contents commonly seem in Early Jurassic Ichthyosaurs, such as the remains of squid-like Belemnites”. Eight different species of Ichthyosaur have been documented with embryos. By far, the most commonly found Ichthyosaur genus with embryos is Stenopterygius. Over a hundred specimens of Stenopterygius from the Holzmaden area of southern Germany have been found with embryos, ranging from one to eleven in number. Stenopterygius Ichthyosaur fossil originally from Germany. Expelled embryo is indicated by the white arrow. Everything Dinosaur has been selected by the Yorkshire Museum to help supply prehistoric animal themed craft materials in support of the Museum’s outreach activities. In addition, the UK-based company has supplied dinosaur and marine reptile themed merchandise to the Yorkshire Museum’s retail outlet. The scientific paper: “The Youngest Occurrence of Ichthyosaur Embryos in the UK: A New Specimen from the Early Jurassic (Toarcian) of Yorkshire” by Boyd, M. J. and Lomax, D. R. (2018) published in the Proceedings of the Yorkshire Geological Society.